Modfellas is an independent online stockist of designer mod clothing brands in the UK, our labels include Brutus Trimfit, Lambretta, Trojan Records, Ska & Soul, Wigan Casino, Merc, Gabicci Vintage, Art Gallery, Britac, Relco and Warrior. We specialise in vintage, indie and retro styles of fashion, whether its the classic British Harrington jacket or an original khaki fur lined fishtail Parka coat. Our aim is to deliver high quality products internationally with excellent service and value for money. We have many different themes and patterns of clothes from scooters and union jack flags to checks and tartan, as well as music related tees celebrating ska, reggae, two-tone and northern soul. 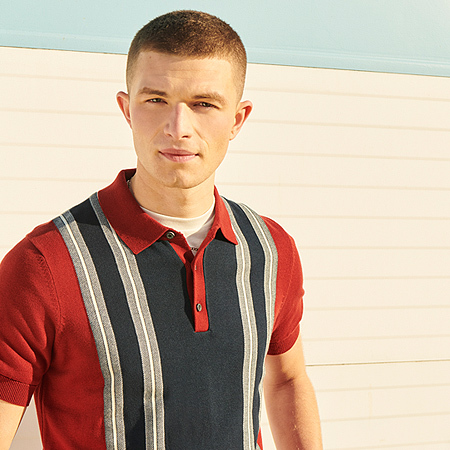 To help you celebrate everything British, we have a variety of union jack themed polos and t-shirts available in various colours from brands Trojan Records & Merc. The flag can be worn on the front or sleeve to show your support at special events, whether that be a royal or sporting occasion, or simply just as a funky fashion statement. Our knitwear range includes a variety of polos, tracktops, cycling tops and jumpers from brands such as Gabicci Vintage, Art Gallery and more. We take great care in selection to ensure you get the best quality for your money, adding both style and presence to your wardrobe to keep you warm and trendy for the Autumn/Winter.